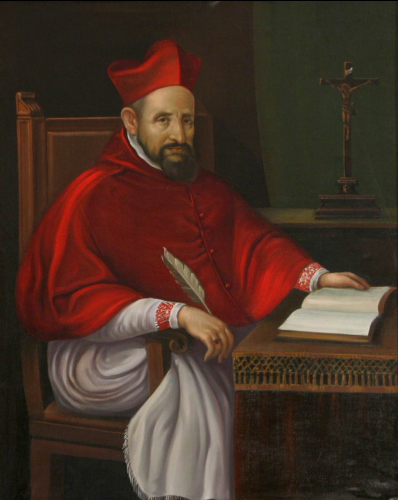 St Robert Bellarmine was born in 1542, and in his youth, received a classical education typical of his era, showing himself to be a particular bright pupil at a very early age. It was an essential part of education in those days that people were trained not only to read and comment intelligently upon the Latin classics, but also to write their own Latin in both prose and verse, and Robert was already skilled at this as a boy. In his early years in the Society of Jesus, which he entered at age 18, he taught the classics in the order’s school in Florence. When he was transferred to Mondovi in Piedmont, he discovered that he was supposed to teach Cicero and Demosthenes, although he knew hardly any Greek at all; he therefore taught himself in one night the grammar lesson he was supposed to deliver the next day. In the midst of his vast output of theological writings, for which he was named a Doctor of the Church in 1931, and his many other scholarly achievements, he also continued to write poetry in both Latin and Italian throughout his life. Formal liturgical devotion to the Guardian Angels is found sporadically in the Middle Ages and Renaissance, but really began to establish itself in the Counter-Reformation period, of which St Robert was such an important protagonist. Pope Paul V (1605-21), who kept him as one of his most valued counselors, was also the first post-Tridentine Pope to formally approve a feast of the Guardian Angels, which he granted to the Holy Roman Empire at the request of Ferdinand II of Austria. When the feast was extended to the universal church by Pope Clement X in 1670, it was given a proper Office, which includes two hymns composed by St Robert: Custodes hominum, which is sung at Matins and both Vespers, and Aeterne rector siderum for Lauds. To judge by St Robert’s compositions for the Guardian Angels, it is a pity that he did not live to contribute to Pope Urban’s project, which might have been more successful with his input. His vocabulary is almost entirely within the established usage of Christian Latinity. The metrical form is one used by Horace in his odes, called the Third Asclepiadean, but he mostly avoids the contorted word order which the classical poets and their later imitators often employed. Here is a splendid recording by the Ensemble Venance Fortunat, in alternating chant and polyphony; a pure Gregorian version sung by the Gloriae Dei Cantores, alternating women’s and men’s voices, is given below. The English translation is that of Alan Gordon McDougall (1896-1965). To drown our souls in Hell.